Jeanerette, LA – January 3, 2017: Louisiana-based boatbuilder Metal Shark has announced several new contracts with Latin American and Caribbean operators, further expanding the company’s presence in the region. 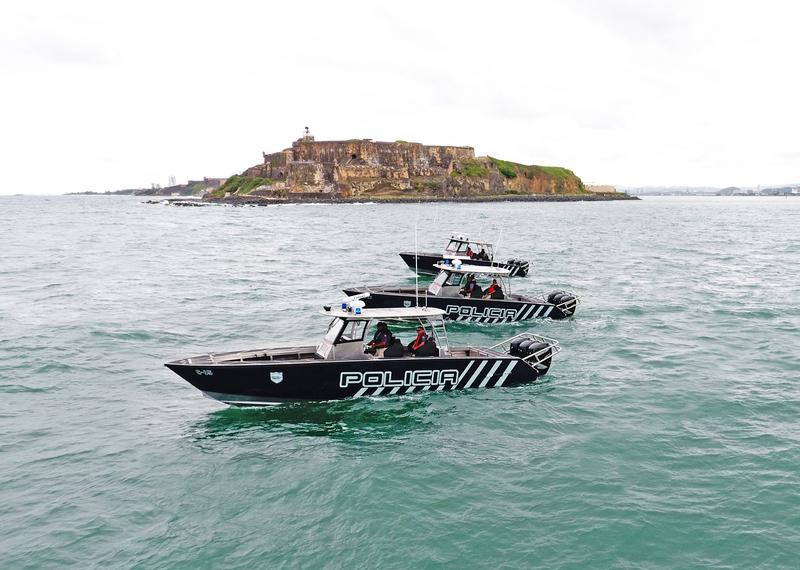 At a recent ceremony with Puerto Rico’s Governor Alejandro Garcia Padilla in San Juan, the Puerto Rico Police Department (PRPD) officially commissioned its first three Metal Shark 36-foot Fearless-class center console patrol boats. The welded-aluminum offshore center console vessels have been designed to operate at speed in the large ocean swells prevalent off the Puerto Rican coastline. Featuring high performance ventilated stepped-bottom running surfaces and powered by triple 300-horsepower Mercury Verado engines, the PRPD’s new patrol boats achieve speeds up to 55 knots. Additional vessels for the PRPD are currently in production at Metal Shark’s Jeanerette, Louisiana production facility. Metal Shark has also announced the Colombian National Police (CNP) as a new customer. After working closely with the agency through an extensive standardization process earlier this year, Metal Shark recently delivered the CNP its first new 33-foot Relentless-class patrol boat. Special features of this welded aluminum center console vessel include a urethane-sheathed closed-cell foam Wing collar, Shockwave S2-Corbin high-backed shock-mitigating seating for five, and additional fold-away crew seating in the bow. The highly maneuverable patrol craft is powered by twin 300-horsepower Evinrude E-TEC G2 engines, which propel it to speeds in excess of 50 knots. In addition, Metal Shark announced that it has been awarded a contract to produce twelve 38-foot Defiant-class pilothouse patrol boats for the Dutch Caribbean Coast Guard. The production of these vessels will begin in early 2017, with deliveries commencing later in the year. 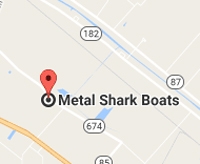 Established in 1986, Gravois Aluminum Boats LLC, and its government/commercial boat entity Metal Shark are leading suppliers of custom boats for defense, law enforcement, and commercial entities. Key customers include the United States Coast Guard, Navy, Air Force, Army, foreign militaries, law enforcement agencies, port operators and pilot associations, fire departments, and commercial entities worldwide. From its two fully self-contained facilities in South Louisiana, Metal Shark produces a wide range of custom monohull and catamaran patrol boats, fireboats, passenger vessels, pilot boats, and other specialty vessels up to 250’. Visit the company’s website at www.metalsharkboats.com. Metal Shark is a leading designer and builder of custom vessels for commercial, defense, and law enforcement applications worldwide.